Many of these men were serious enthusiasts, with impressive collections and having visited almost all the distilleries in Scotland (including those that have long since closed), so we patted ourselves on the back for having already booked the very tour they were recommending. Distillery waiting room, where you are plied with free drams while you wait for your tour to begin. 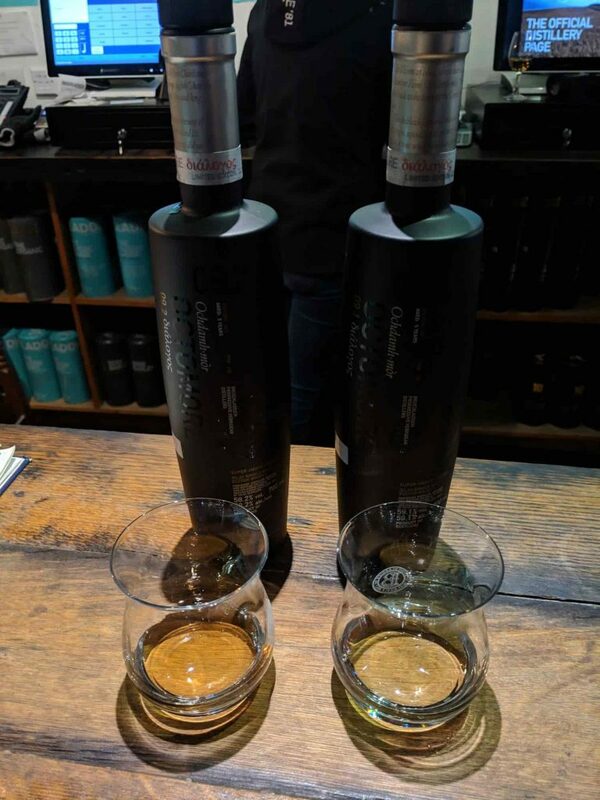 and a 2009 Octomore 6.3 (unique in its age of 9 years, unlike the released Octomores which are typically 5 years). Between the generous drams, our tour guide gave us a brief history about the distillery, beginning with its origins: started by three brothers hailing from a well-known whisky family (Harvey), with one leading the design, the second leading the engineering, and the third leading the financing. 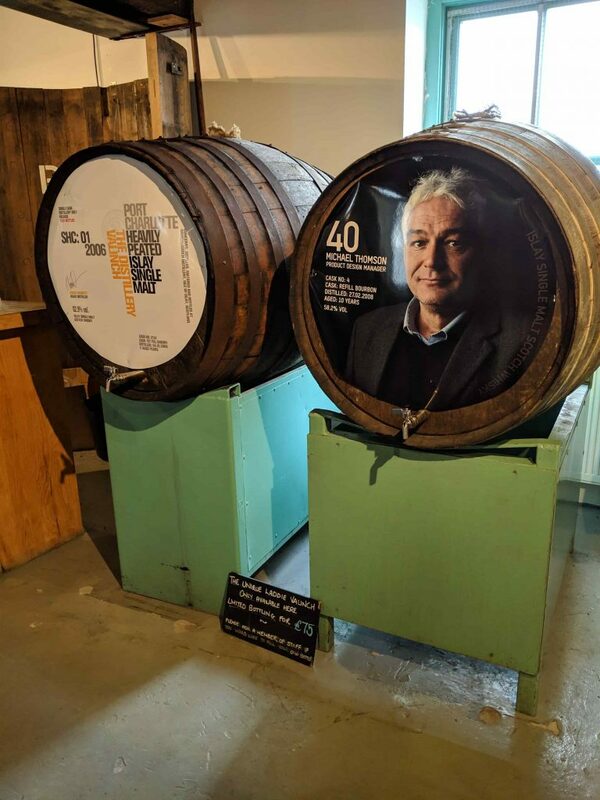 The brothers had a falling out but the distillery remained in the hands of the oldest brother until his death, after which Bruichladdich changed hands several times until Whyte and Mackay purchased it and mothballed it (booooo!). During a bike ride past the shuttered distillery, Mark Reynier became intrigued and wandered in, asking one of the distillery men about it. He was told in not-so-polite terms (one beginning with an “F”) to leave. 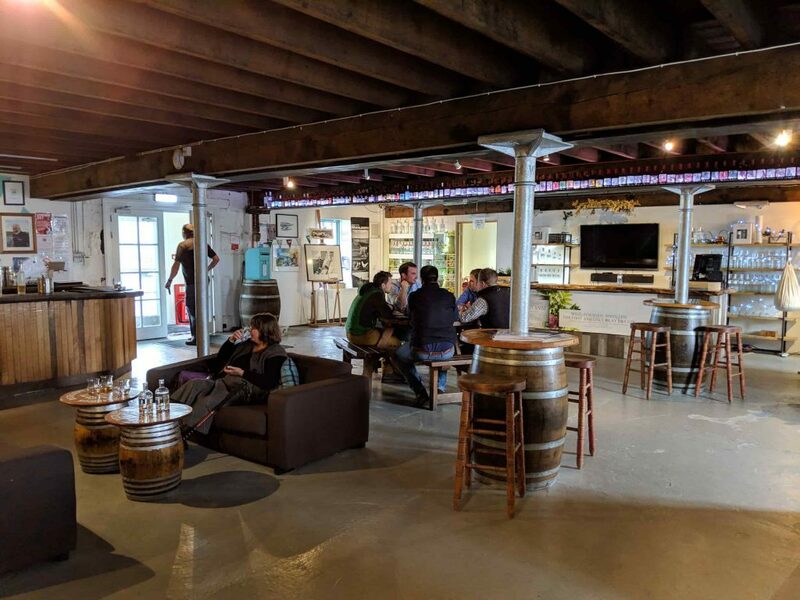 He nonetheless pursued the distillery aggressively (eventually hiring said man) and purchased the distillery for around $5M for the casks (around $40 per cask) and an additional $2M for the building and other assets. He sold the company for 58M GBP to Remy Cointreau. It’s a bit of a Cinderella story, and double-the-fun because you’re drinking some exclusive cask-strength whisky while listening. 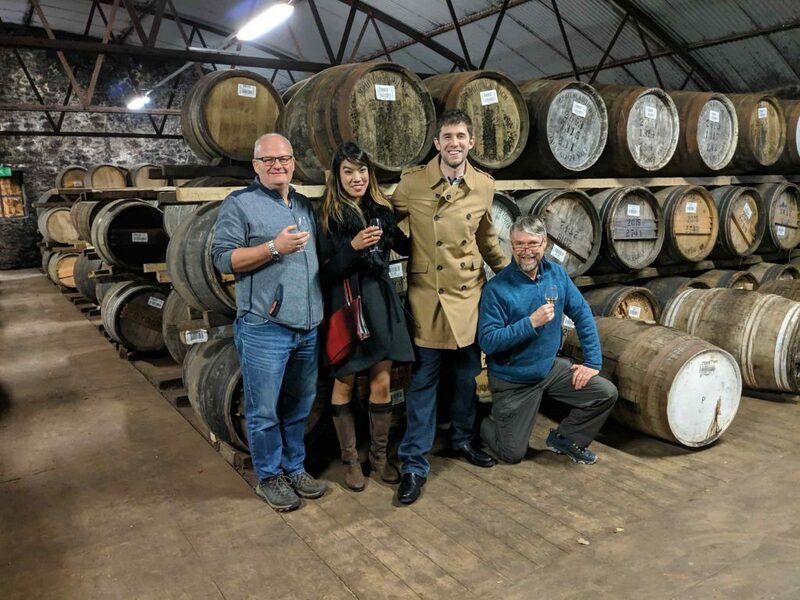 The tasting can last up to an hour but took our little group of four only 20 minutes before we returned (very happily) to the gift shop to peruse the distillery-exclusive bottlings and sample more of their whiskies. We ended up bottling our own distillery exclusive straight of the cask: a sherry-cask finished Port Charlotte, which ended up being one of our favorite acquisitions from the trip. It’s a raisiny smoke bomb – and the antithesis of a whisky wallflower. The tldr; of the visit? 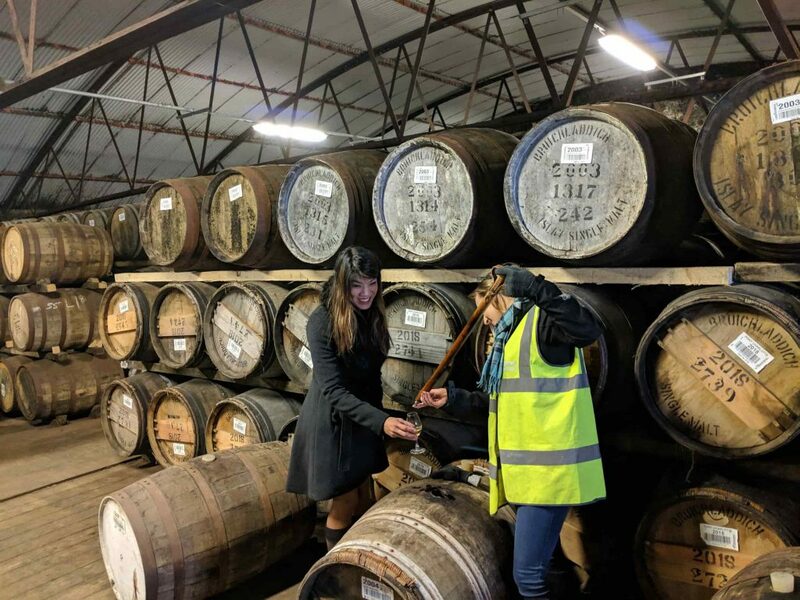 Even if you get exhausted with all of the distillery visits and their transparent self-promotions, definitely go on the Bruichladdich warehouse tour. It’s fast – it’s fun – and for 20 GPB, an incredible deal for the whiskies you’ll get to sample. 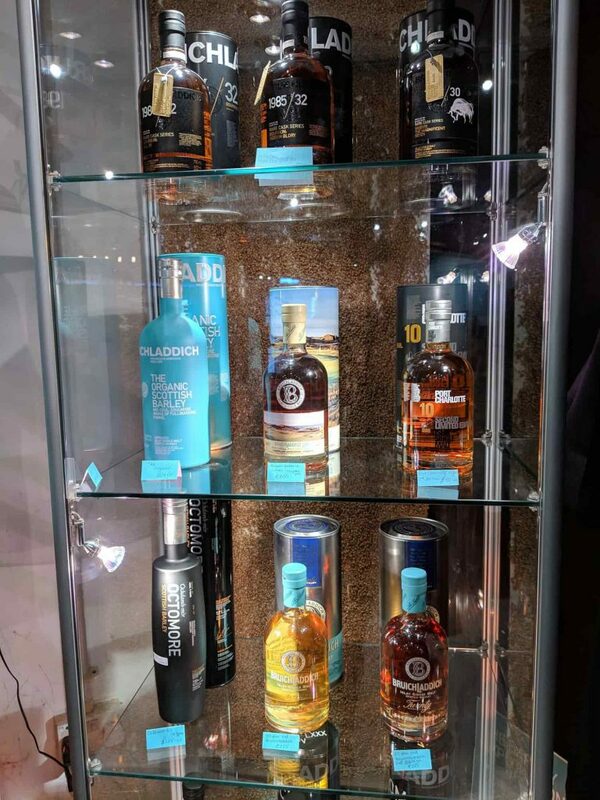 Unlike other distilleries, Bruichladdich lets the whiskies market themselves. We ended up filling up a 375 ml bottle from the Port Charlotte (left) aged in sherry. One of our favorite acquisitions during the trip! the distillery love of my life. They have such wonderful things!